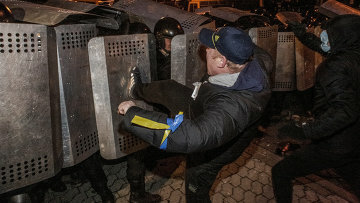 Prosecutors close 35 cases over Kiev riots | Russian Legal Information Agency (RAPSI). KIEV, January 27 (RAPSI) – Kiev Prosecutor’s Office has closed 35 criminal proceedings over mass pro-Eurozone protests held in November-December 2013, according to the Prosecutor’s Office spokesperson Yana Sobolevskaya. Proceedings against three suspects have been closed, and a motion to close additional 18 cases was filed with the courts by Kiev Prosecutor’s Office. Two motions are now pending for review in Shevchenkovsky District Court. In December, Police in Kiev have opened 64 criminal cases since mass riots began in the Ukrainian capital, and 14 individuals have been detained. Protests began in Kiev on November 21 after president Yanukovych refused to sign an Association Agreement with the EU. The demonstrations turned violent on January 19, after protesters attacked police blocking a street leading to parliament. 13:40 27/01/2014 Kiev Prosecutor’s Office has closed 35 criminal proceedings over mass pro-Eurozone protests held in November-December 2013, according to the Prosecutor’s Office spokesperson Yana Sobolevskaya.